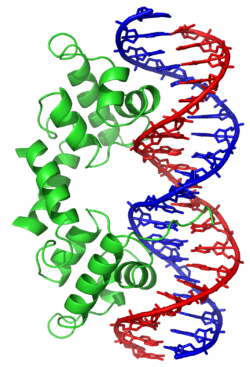 In proteins, the helix-turn-helix (HTH) is a major structural motif capable of binding DNA. It is composed of two α helices joined by a short strand of amino acids and is found in many proteins that regulate gene expression. It should not be confused with the helix-loop-helix domain. ↑ Brennan RG, Matthews BW (1989). "The helix-turn-helix DNA binding motif.". J Biol Chem. 264 (4): 1903–6. PMID 2644244. 1 2 Matthews BW, Ohlendorf DH, Anderson WF, Takeda Y (1982). "Structure of the DNA-binding region of lac repressor inferred from its homology with cro repressor.". Proc Natl Acad Sci U S A. 79 (5): 1428–32. doi:10.1073/pnas.79.5.1428. PMC 345986 . PMID 6951187. ↑ Anderson WF, Ohlendorf DH, Takeda Y, Matthews BW (1981). "Structure of the cro repressor from bacteriophage lambda and its interaction with DNA.". Nature. 290 (5809): 754–8. doi:10.1038/290754a0. PMID 6452580. ↑ McKay DB, Steitz TA (1981). "Structure of catabolite gene activator protein at 2.9 A resolution suggests binding to left-handed B-DNA.". Nature. 290 (5809): 744–9. doi:10.1038/290744a0. PMID 6261152. ↑ Pabo CO, Lewis M (1982). "The operator-binding domain of lambda repressor: structure and DNA recognition.". Nature. 298 (5873): 443–7. doi:10.1038/298443a0. PMID 7088190. 1 2 Wintjens R, Rooman M (1996). "Structural classification of HTH DNA-binding domains and protein-DNA interaction modes.". J Mol Biol. 262 (2): 294–313. doi:10.1006/jmbi.1996.0514. PMID 8831795. ↑ Suzuki M, Brenner SE (1995). "Classification of multi-helical DNA-binding domains and application to predict the DBD structures of sigma factor, LysR, OmpR/PhoB, CENP-B, Rapl, and Xy1S/Ada/AraC.". FEBS Lett. 372 (2-3): 215–21. doi:10.1016/0014-5793(95)00988-L. PMID 7556672. 1 2 Aravind L, Anantharaman V, Balaji S, Babu MM, Iyer LM (2005). "The many faces of the helix-turn-helix domain: transcription regulation and beyond.". FEMS Microbiol Rev. 29 (2): 231–62. doi:10.1016/j.femsre.2004.12.008. PMID 15808743. ↑ Religa TL, Johnson CM, Vu DM, Brewer SH, Dyer RB, Fersht AR (2007). "The helix-turn-helix motif as an ultrafast independently folding domain: the pathway of folding of Engrailed homeodomain.". Proc Natl Acad Sci U S A. 104 (22): 9272–9277. doi:10.1073/pnas.0703434104. PMID 17517666. ↑ Ogata K, Hojo H, Aimoto S, Nakai T, Nakamura H, Sarai A, et al. (1992). "Solution structure of a DNA-binding unit of Myb: a helix-turn-helix-related motif with conserved tryptophans forming a hydrophobic core.". Proc Natl Acad Sci U S A. 89 (14): 6428–32. doi:10.1073/pnas.89.14.6428. PMC 49514 . PMID 1631139. ↑ Hinrichs W, Kisker C, Düvel M, Müller A, Tovar K, Hillen W, et al. (1994). "Structure of the Tet repressor-tetracycline complex and regulation of antibiotic resistance.". Science. 264 (5157): 418–20. doi:10.1126/science.8153629. PMID 8153629. ↑ Iwahara J, Clubb RT (1999). "Solution structure of the DNA binding domain from Dead ringer, a sequence-specific AT-rich interaction domain (ARID).". EMBO J. 18 (21): 6084–94. doi:10.1093/emboj/18.21.6084. PMC 1171673 . PMID 10545119. ↑ Donaldson LW, Petersen JM, Graves BJ, McIntosh LP (1996). "Solution structure of the ETS domain from murine Ets-1: a winged helix-turn-helix DNA binding motif". EMBO J. 15 (1): 125–34. doi:10.2210/pdb1etc/pdb. PMC 449924 . PMID 8598195. ↑ Sharrocks AD, Brown AL, Ling Y, Yates PR (1997). "The ETS-domain transcription factor family". Int. J. Biochem. Cell Biol. 29 (12): 1371–87. doi:10.1016/S1357-2725(97)00086-1. PMID 9570133. ↑ Alekshun MN, Levy SB, Mealy TR, Seaton BA, Head JF (2001). "The crystal structure of MarR, a regulator of multiple antibiotic resistance, at 2.3 A resolution.". Nat Struct Biol. 8 (8): 710–4. doi:10.1038/90429. PMID 11473263. Struhl K (1989). "Helix-turn-helix, zinc-finger, and leucine-zipper motifs for eukaryotic transcriptional regulatory proteins.". Trends Biochem Sci. 14 (4): 137–40. doi:10.1016/0968-0004(89)90145-X. PMID 2499084. Gajiwala KS, Burley SK (2000). "Winged helix proteins.". Curr Opin Struct Biol. 10 (1): 110–6. PMID 10679470. Santos CL, Tavares F, Thioulouse J, Normand P (2009). "A phylogenomic analysis of bacterial helix-turn-helix transcription factors.". FEMS Microbiol Rev. 33 (2): 411–29. doi:10.1111/j.1574-6976.2008.00154.x. PMID 19076237. Hoskisson PA, Rigali S (2009). "Chapter 1: Variation in form and function the helix-turn-helix regulators of the GntR superfamily.". Adv Appl Microbiol. 69: 1–22. doi:10.1016/S0065-2164(09)69001-8. PMID 19729089. Brennan RG (1993). "The winged-helix DNA-binding motif: another helix-turn-helix takeoff.". Cell. 74 (5): 773–6. doi:10.1016/0092-8674(93)90456-Z. PMID 8374950. Huffman JL, Brennan RG (2002). "Prokaryotic transcription regulators: more than just the helix-turn-helix motif.". Curr Opin Struct Biol. 12 (1): 98–106. doi:10.1016/s0959-440x(02)00295-6. PMID 11839496.